Manali, in Himachal Pradesh has been the oldest favourite summer destination of India. It is the perfect destination for people who want to enjoy snow. In winters, snow can be found in the town and Solang valley. Rohtang pass is the most attractive snow destination in summers for the ones who want to beat the heat in the cities. Rohtang pass is the only place in India where you have access to snow by road in the summers. Naggar Castle belonged to the king of Kullu in the medieval age. This castle is now converted into a heritage hotel, which is open for visit to outsiders too. Naggar is a small settlement in Kullu district, 20 kms before Manali. The castle is built in traditional Himachali architecture from wood, mud and stones and showcases beautiful wood carvings from the olden days. The courtyard of the castle is converted into a cafe overlooking beautiful mountains. In the early 19th century, a Russian artist Nicholas Roerich lived in Naggar and now his house is converted into an art gallery which is a major attraction near Naggar castle. This gallery houses rare paintings of Nicholas Roerich. The gallery gives enriching experience to all art lovers and the location of the art gallery gives a placid experience to all nature lovers. Jana falls is a beautiful natural waterfall in the village named Jana. It is around 32km drive from Manali and 12 km drive from Naggar. The road to Jana falls takes you through beautiful pine forests and gives breathtaking views of the Kullu valley. In winters, the road to Jana falls gives a spectacular views of snow covered mountains. The fall forms a natural pool swimming for a refreshing dip. There are few dhabas near the fall that serve local Himachali dishes, which is definitely not to be missed. Rumsu is a small hamlet, 2 km away from Naggar. Rumsu falls in the route to Chanderkhani pass trek. It is a scenic drive up to this village and you can observe the simple lifestyle of the Himachali people. In winters, the snow covered village looks alluring. There are beautiful villages between Kullu and Manali on the Kullu-Naggar-Manali road like Karjan, Sajla, Soil, Siyal, etc. which depict the traditional Himachali lifestyle. The villages here are still decorated with the vibrant traditional Himachali houses. Walk around the villages to meet people, talk to them about their lifestyle and take beautiful pictures. Tripura Sundari Temple in Naggar is a unique temple built completely with Deodhar wood in the ancient times. The temple built in traditional Himachali style looks pretty in tranquility. 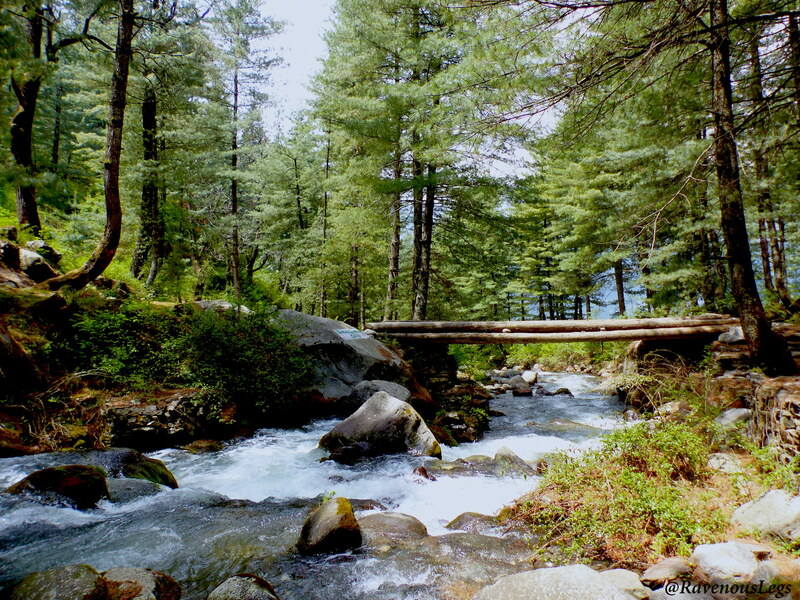 Areas around Manali are densely covered with tall pine and cedar trees. Hiking in these forests to get a birds-eye view of the valley is unique experience. The hiking trails take you some natural wonders like likes, villages, rivers or to villages. Spend half a day hiking with some packed food on the way to spend time with nature and yourself. Kullu valley is famous for the apple orchards. If you go in the right season for apples, it will be a fun experience to visit some apple orchards and go apple plucking with the people working in the orchard. You get to bite delicious apples in the process. For the more adventurous ones, Bhrigu Lake trek (14100 ft) is an excellent trekking experience around Manali. The 2/3 day trek starts from a village called Gulaba. Bhrigu lake is a glacial lake which is surrounded by snow or grass, depending on the season. There are various trekking companies in Manali that organise this trek. There are quite a few boutique properties in Naggar. You can live in Naggar Castle, or few other properties in the villages around in a serene ambiance. Experience Himachali culture through Himachali food, cottages, art and architecture while living in these properties. In order to plan a trip to suit your travel needs, check out Scout My Trip. Previous Papa Kehte Hain Beta Rent Karega..?